My readers frequently ask me for recommendations about sewing machines, fabric and sewing tools. I could talk on and on, day after day, about my favorite products, but alas, that’s not very practical. So instead I’ve decided to create a series of posts called Cucicucicoo Recommends to answer these questions. Be sure to check out the rest of the series here! I already wrote a few months ago about how to choose your first sewing machine, and today I want to talk about what I consider to be the best sewing tools for both beginner and advanced sewers that will make your sewing projects easier and more professional-looking. Of course it’s of utmost importance to know the basics of sewing to create fantastic sewn clothing and objects, so if you’re just starting to learn, I highly suggest you take a look at my free Learn to Machine Sew course. You can often tell the skill of a seamstress by the quality of her work. However, certain tools and notions can make certain techniques so much easier to master, and give an edge to those who use them. If you’ve ever set foot in a fabric shop, you’ll have noticed that there are about a gazillion sewing supplies. 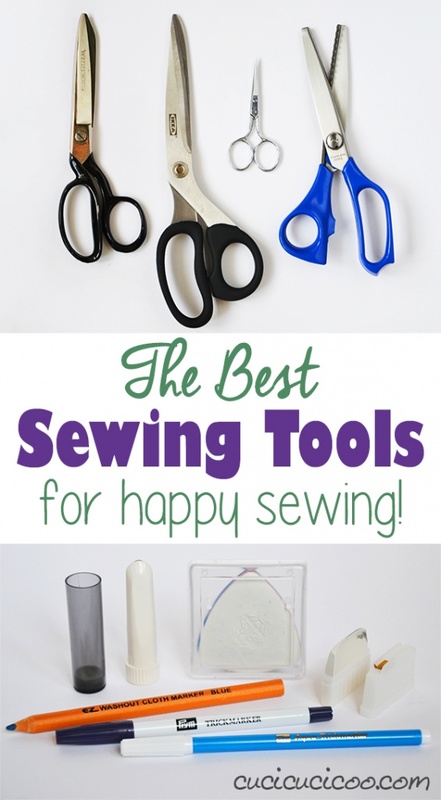 Some are tools that you really truly need to sew while others are optional items that you can do without, but that will make your life much easier. In each category I will explain which supplies are absolutely necessary and others that you can wait to procure if you’re just starting out sewing, but that I do suggest getting at some point or another. 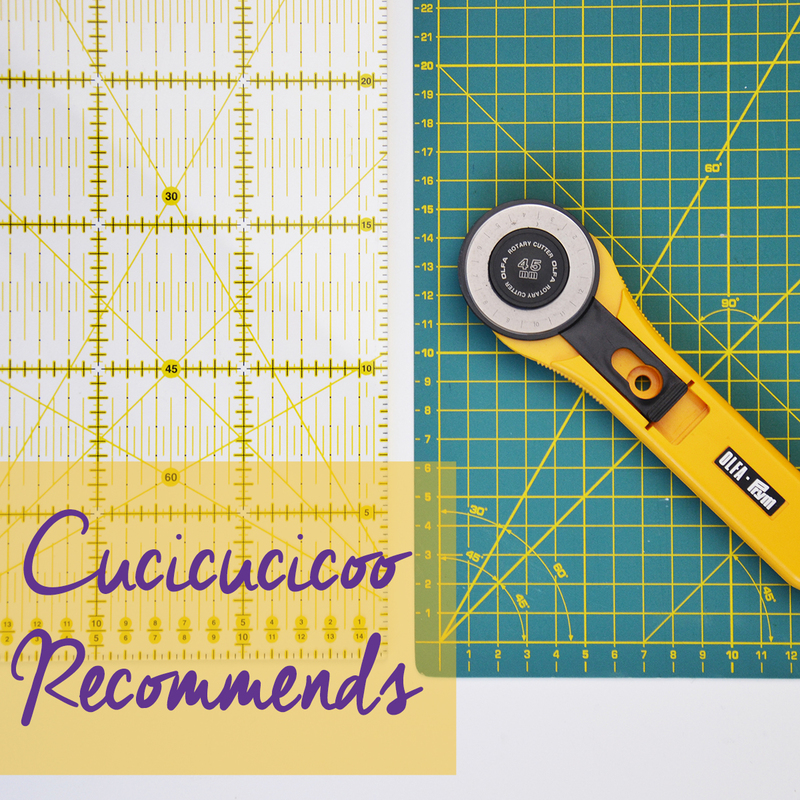 So enough chit chat, let’s get right down to the Cucicucicoo-recommended best sewing tools! Please note that many of the items are affiliate links, meaning that I earn a small commission on those purchases made. You will not pay a cent more by clicking on them, but it is a way to support this website and make it possible for me to continue offering free quality content! If you notice that one of the links on this page doesn’t work, leave me a comment below or write to me at lisa@cucicucicoo.com so that I can update the link! Ever heard the saying “Measure twice, cut once”? You can measure any number of times you want, but once you make a cut, there’s no going back. And if you want clothing and objects sewn to exactly the right size, you need to measure your body or whatever else you’re sewing correctly. I advise you use measuring tools that have both inches and centimeters so that you will be prepared for everything. Classic ruler. Chances you already have a normal 1-foot ruler in your home. And you quite possibly also have a yardstick. These will come in handy all the time, so always keep them on hand. Living in Europe, where the metric system is used, I don’t have a yardstick, so I use my 60-cm quilter’s rule (which I’ll talk about below in the “Cutting” section) and a totally normal rigid tape measure for measuring long things. Measuring tape. Happily, the world is not made of just straight lines, especially not your body, so you absolutely must have a flexible measuring tape. I prefer the retractable type, but choose what works best for you. 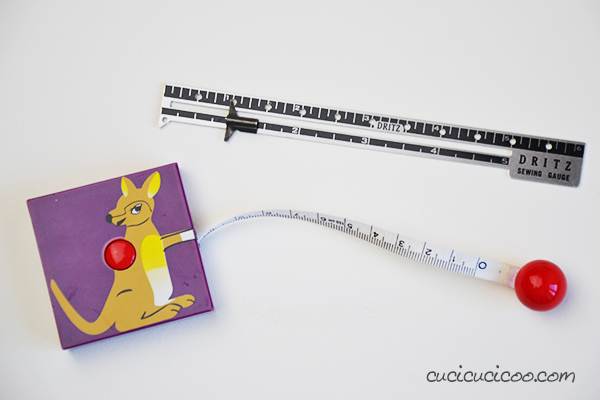 I bought this boxing kangaroo tape measure years ago at the gift shop at the Madre Museum in Naples, but haven’t seen it for sale anywhere since then. I also have a super cheap-o tape measure to put in a small tin of sewing supplies when I take my work out with me. Sewing gauge. This little ruler with a sliding marker is not an absolutely essential sewing tool, however it does make it easier to hem fabric and make markings along curves. You set the slider to the desired length, that way you can quickly and easily see where exactly 5/8″, for example, is without having to search for the right little line on a regular ruler for every marking. There are a lot of different ways to mark fabric in a non-permanent way, and you may want to have more than one tool to use in different situations and on different fabrics. It’s important to remember that there is NO guarantee that any of these marking tools will disappear 100% from your fabric, so it’s always best to test them on a scrap of the fabric being used before marking up your project. 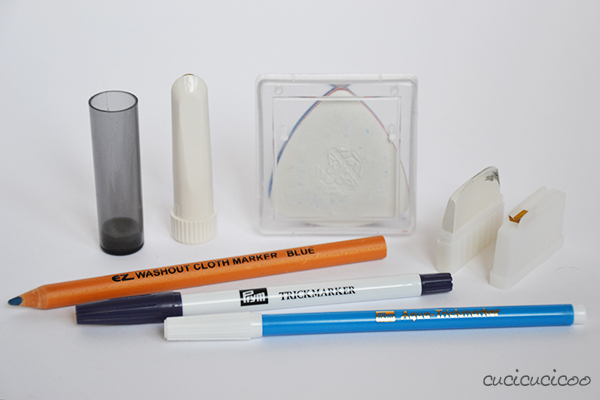 Tailor’s chalk is the classic tool used for marking fabric. I have many types of chalk, but my favorite is this one with a plastic holder with a built-in sharpener. You can also find different colored tailor’s chalk, which is useful if you’re marking a light-colored fabric. A more modern take on tailor’s chalk is the powdered chalk wheel (I have this one by Clover), which leaves a very light and straight line that is easily brushed off of most fabric. If it runs out of chalk, you can always buy a refill. Sometimes chalk can wipe off a little too easily or just doesn’t work well on certain fabrics. In these cases I suggest trying a marking pen with water soluble ink, a tool that I use frequently. The turquoise ink shows up well on most fabric, lasts long enough for me to work with, and will come right off with a little rinse under the sink or a bit of spit wiped on small marks with a finger. Once or twice it’s happened to me that the ink apparently disappeared when dampened, but returned upon drying, so do make sure to test on a scrap. Some people love a similar tool, the disappearing ink marking pen, but I don’t like not having control over when the markings disappear. I’ve found that the ink disappears almost immediately when the pen gets a little old, which is incredibly frustrating. Marking pens can be very convenient, but they definitely cost more than a regular pen. Luckily there are some totally normal pens not intended for sewing purposes that work well for non-permanent fabric marking. Crayola washable markers are made for little kids who inevitably color all over themselves when getting creative. They work great for marking fabric, come in all different colors, and almost always wash out perfectly. Pilot Frixion pens are also great and highly washable. The ink from these pens disappears with heat, so it generally vanishes when you iron it. I once lost half a day’s worth of work when, trying to save paper, I put a sheet of paper full of important notes through the printer, whose heat erased all the pen markings. I like to use these pens for tracing embroidery patterns on fabric because the tip is so narrow. Again, I can’t stress enough: always make very sure to do some tests before using any of these products on your sewing projects. Please, please, please do not use your household scissors gunked up with glue residue for cutting fabrics. It will be sure to frustrate you. You need super sharp cutting tools that you will use exclusively for fabric because using them on any other material will dull the blades. Do not let anyone get near your fabric scissors if they don’t intend to cut fabric with them. Some people suggest literally locking up your fabric scissors but perhaps a less drastic measure is to knot a bit of yarn around one finger hole so that they don’t get mixed up with regular household scissors. 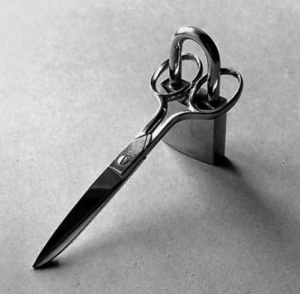 Scissors. There are all sorts of fabric scissors. This is part of my collection. The ones on the left are regular fabric scissors that used to be my mother’s. 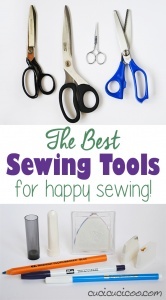 These are very important to have, as you will do most of your fabric cutting with them. 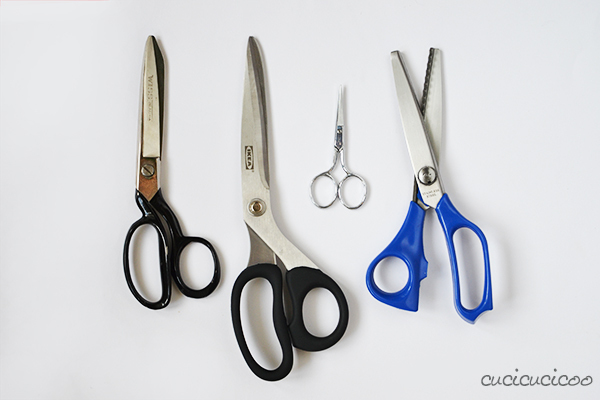 The other types of scissors are not totally necessary, but are quite useful for more specific use. Dressmaker shears, whose angled handle permits the bottom blade to rest against the table while cutting out pattern pieces. Mine are super inexpensive Ikea shears, which are actually pretty good for what they cost. Embroidery scissors are mini scissors good for small cutting appliqué pieces or any other precision work. The scissors with zig-zag blades are called pinking shears. They are generally used for cutting the inside edges of unfinished seams because the zig-zag cut frays less than a straight cut. Our family is very rough with our clothing so that’s not really enough for me, so I prefer to finish edges by sewing them. I use pinking shears mostly as a lazy way of notching curves in fabric (which you can read about here). Other cutting tools. Every self-respecting quilter has a rotary cutter, a cutting mat and a quilter’s rule, but they are incredibly useful for all sorts of other fabric cutting, too. They can seem like a big expense, but the mat and rule will last a long time if you treat them nicely, and they will save you so much time and effort when cutting straight lines. You don’t need these tools when starting out, but I suggest you invest in them if you want to continue sewing somewhat seriously. Rotary cutters come in three sizes and variations on the style. The 60mm and 45mm sizes are good for cutting lots of long straight lines, while the 28mm size is useful for cutting curves (obviously without a ruler). The most common brands are Olfa and Fiskars, and I personally have very simple Olfa rotary cutters in 45mm and 28mm sizes. I tend to drop them because I’m a klutz, and so the blades often get a bit dented, in which case they need to be replaced with a new blade (make sure you get the right size and handle them very carefully). There are even pinking blades and other decorative cutting blades, though I’ve never used them myself. 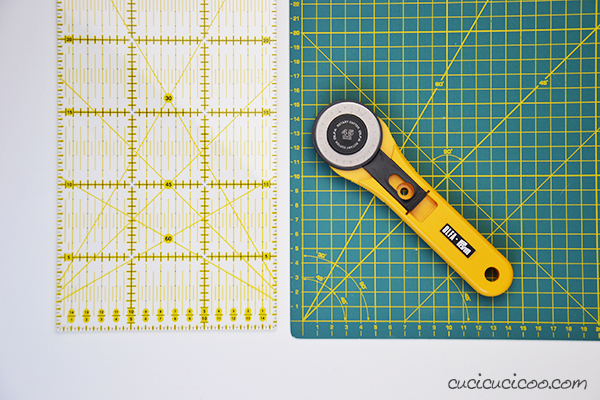 Cutting mats have a grid printed on them, sometimes on both sides, in inches, centimeters, or both, and some also have diagonal lines of various angles and curves which I personally never use, but are extremely useful for quilting. I have two cutting mats: a small A-4 sized 20 x 28 cm (8.5 x 12″) one by the German brand Rayher, which I generally use with an X-acto knife for crafting purposes, such as cutting out freezer paper stencils, and this large 24 x 36″ cutting mat by Olfa, which is what I use very frequently for cutting fabric. 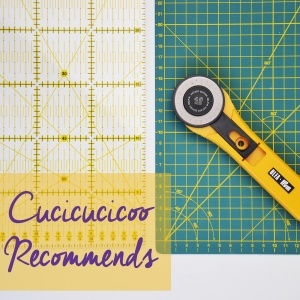 Quilting rulers are the special rulers that you use to guide a rotary cutter. They have a grid in either inches or centimeters and are clear so that you can see the fabric underneath them. When cutting, you line up the fabric on the cutting mat’s grid and/or the quilting rule’s grid, then cut along the edge with the cutter. These special rules also come in many sizes. I have this Omnigrid 6 x 24″ quilting ruler, although I bought it in Italy, so its grid is marked 15 x 60 cm. 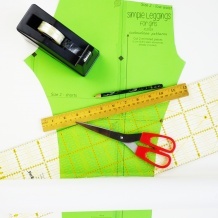 After cutting your fabric pieces, you’ll need to hold them together precisely in order to sew them. The most common tool to do this are pins, but there are other solutions, too. Pins. There are many different types of straight pins, though I only use three types. I use these glass head pins when sewing woven fabric. I try to avoid plastic heads because they can melt if you accidentally pass the iron over them. As I wrote in my post about how to sew knit fabric, it’s important to use ball point pins for knits to avoid ruining the fibers. Another very useful pin is the silk pin, otherwise known as satin pin or extra-fine pin. Larger pins can leave holes in very lightweight fabric, such as silk, so these very thin pins leave minimal marks. You also need a few sizes of safety pins. I like using them to mark hems or other things in garments when you try them on to avoid pricking yourself and to keep them from slipping out when you take off the item. 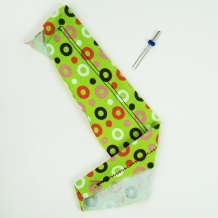 They are also extremely useful when slipping a drawstring or elastic through a casing. Wonder clips. Sometimes you want to avoid making holes, however tiny they may be, in fabric, for example with PUL and other laminated fabrics. This is when you want to use Wonder clips, which are just plastic clips with one flat side. I have these small clips, but they come in all different sizes. Pin cushion. There are loads of ways to keep your pins in one place, and they come in all sorts of styles and materials. 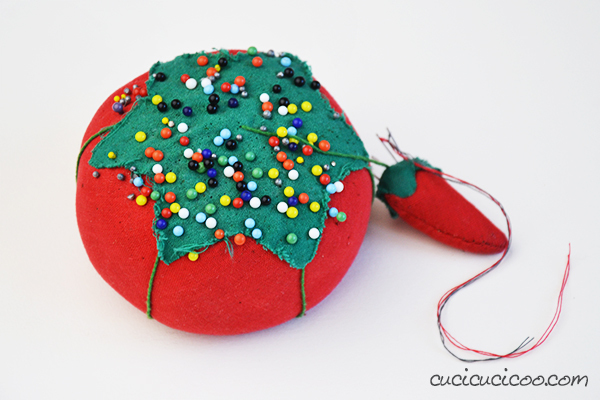 The classic pin cushion is the tomato pin cushion with an attached strawberry filled with emery sand. Stick pins and needles in and out of that strawberry to clean and sharpen them. Some people prefer wrist pincushions, and others prefer magnetic pin cushions. I don’t like the first because it gets in my way and I don’t like the second because I prefer having the pin head always facing up so I don’t prick myself, but the choice is up to you. 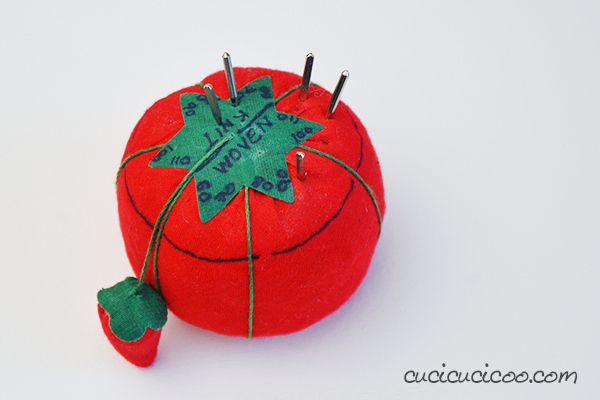 I suggest having more than one pin cushion so that you can keep your different types of pins separate. I keep yet another pin cushion for storing partially used machine needles. I divided a small pin cushion into segments and labelled each with a permanent marker. Half is for needles for wovens and the other half needles for knits. Then each half is split for each size 8/60 through 18/110. I then drew a line going around the circumference of the pin cushion partway down the side so that I could put my overlock machine needles in the same categories while keeping them separate from the regular machine needles. If this post is interesting or useful, bookmark it or Pin It here! Dai, prova Donatella! Vedrai che ti divertirai tantissimo! Grazie per le cose utili che scrivi,anch’io amo utilizzare le stoffe che ho in casa:camicie di mio marito e delle mie amiche,lenzuola ..e altro perchè sanno che non butto mai niente.Purtroppo spesso manca lo spazio per accatastare i vari indumenti per il riuso e a volte mi sento sommersa dalle cose e dalle idee che potrei concretizzare…ma continuo a conservare.Ti auguro Buone Feste in famiglia. 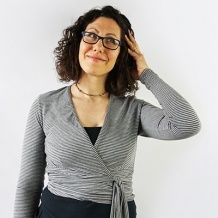 Ho lo stesso problema con gli spazi, Daniela! Ho dei contenitori di vestiti da refashionare in ogni buco della casa! In estate ho tolto molti di questi vestiti e li ho donati perché mi sembrava eccessivo… e mi serviva lo spazio! Auguri anche a te e alla tua famiglia! E’ un articolo molto utile, complimenti! Io sono una sarta alle prime armi, e infatti ho pochi di questi strumenti: 2 paia di forbici (uno grande e uno medio), puntaspilli e spilli, metro da sarta pieghevole. Credo che mi comprerò presto il tappeto da taglio e il gessetto (ieri sera ho cucito le tende per la cucina e ho disegnato la riga lungo la quale tagliare con un pastello sul retro della stoffa, facendo dei segni col metro da sarta 🙁 quasi mi vergogno a dirlo!). Aspetto con ansia i tuoi prossimi articoli, soprattutto quello sui libri di cucito! A proposito: perchè non aggiungere anche un articolo con qualche consiglio su come organizzare l’angolo del cucito in casa? Hi Lisa! Sorry about the seam gauge 🙂 I missed your Part I in my first read through your postings. I really appreciated that link to how to care for your cutting mat! I have a strange sort of rubbery type of slab that was described as a cutting mat cleaner – you scrape it across the surface of your mat and it sort of pulls out the fibers that might be stuck in the cuts but I never knew it liked to be moisturized and the best way to clean it. Thank you! How interesting, Kathleen! I’d never heard of that sort of product to clean the cutting mat! I’ll have to look into it! le chiedevo di indicarmi come si usano gli stabilizzatori, sia per applique che per altri lavori, e quali sono le marche migliori. Le nella sua mail parlava di tessuto a strappo ma non sono riuscita, anche guardando tanti tutorial, a capire cosa sia e come e quando si usa. Ciao Lisa!! non posso dirti altro se non GRAZIE! Sto utilizzando il tuo sito per cominciare a sviluppare il mio sogno, lo trovo dettagliato e sviluppato in perfetta sinergia con una mente che sta entrando in questo meraviglioso mondo. Passo dopo passo, è sempre più affascinante. E’ un regalo, online! sto trascrivendo tutto ciò che insegni in quella che è la mia agenda “del sapere”, una volta completata sono certa di poter dire di avere delle solide basi da cui partire. Sono contentissima di esserti d’aiuto! Ti consiglio di procedere una lezione alla volta con il corso di cucito. L’ho creato in modo che chi non ha mai cucito può seguire le lezioni e i tutorial in ordine proposto!